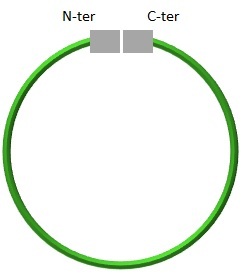 This covalent link occurs between thiols of 2 cysteins. 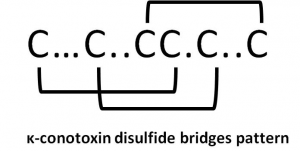 Disulfide bridges are natural modifications that form highly structured peptides and are generally mandatory for the biological function of the peptides. As example, peptides present in animal venoms, some AMP, … contain multiple disulfide bridged peptides. Obtaining correctly folded peptides when starting from a linear synthetic peptides require an expertise in the folding, analytical technics and purification of each isomers. In certain cases, some projects can require an extra cysteine which can impact the expected folding. Smart Bioscience is able to block the cysteine not involved in a disulfide bridges and make it available after the folding. Concerning peptides that are parts of proteins and contain disulfide bridges, when not surrounded by the rest of the sequence, in this specific case peptides can be hard to fold according to the initial protein pattern. This cyclization consists in forming an amide bond between the C-terminus with the N-terminus. It has been demonstrated to improve the oral stability of certain therapeutic peptides without affecting their biological activity. 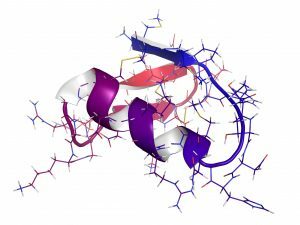 Smart Bioscience has an extensive expertise in peptide folding as well as modification of folded peptides (fluorescent or biotin labeling for example). Contact us to discuss about the cyclic peptide you wish to produce.